The handset maker Lenovo will soon launch a smartphone with its first slider camera, Lenovo Z5 Pro. The company's manager has confirmed that the Lenovo Z5 Pro will be launched on October 1. Recall that VP Chang Chen had released several teasers before the launch of the Lenovo Z5 launched in June. It was said that Lenovo Z5 was a phone with a Design Notch Design, Large Battery and 4 TB Storage. But when Lenovo Z5 was officially launched, none of these features were present in the handset. 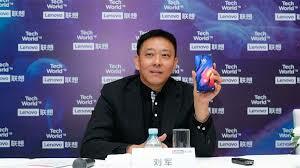 During a press conference in Beijing, a manager of the company presented Lenovo Z5 Pro in front of everyone. Seeing the picture shows that Lenovo's handset will come with the Nokia design. Chinese website Weibo said that Lenovo Z5 Pro will be launched in China on October 1. Let us know that this day is also celebrated in China as National Day. A video of Lenovo Z5 Pro was also leaked on Weibo. The video shows that Lenovo's handset can be given a slider camera like Oppo Find X. The video shows that the camera can be slammed up and down easily. Here's the thing to note here that the OPPO Find X has a motor which helps to slide the camera. But Lenovo Z5 Pro does not have to do this, in it, you have to slide the camera itself. The official specification of Lenovo Z5 Pro and the price will rise only on the day of the launch event.